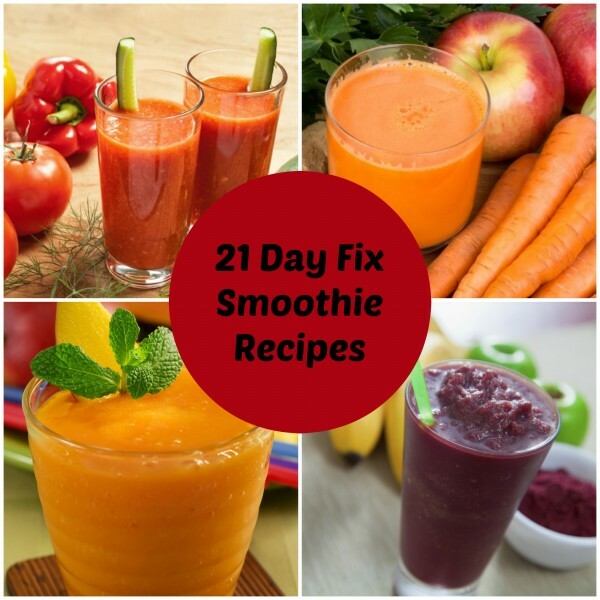 I recently started the 21 Day Fix diet and wanted to be sure to continue to incorporate smoothies into my eating plans. You can make smoothies for the plan using their Shakeology method, which incorporates the use of a protein power, but that is honestly more expensive than necessary in my opinion. Instead, make smoothies that incorporate another protein source or a cheaper protein powder to help keep you full. Or, in the alternative, make a fruit and vegetable smoothie and eat a protein item separately (I like to pair a small vegetable based smoothie up with a hard boiled egg). I haven’t previously listed 21 Day Fix container sizes with my smoothie recipes, so here is a little cheat sheet type of guide of ingredients with their container size. Mix and match these to your heart’s content! Then, I’ll also link to some recipes on this site with my modified ingredient list and container calculations. 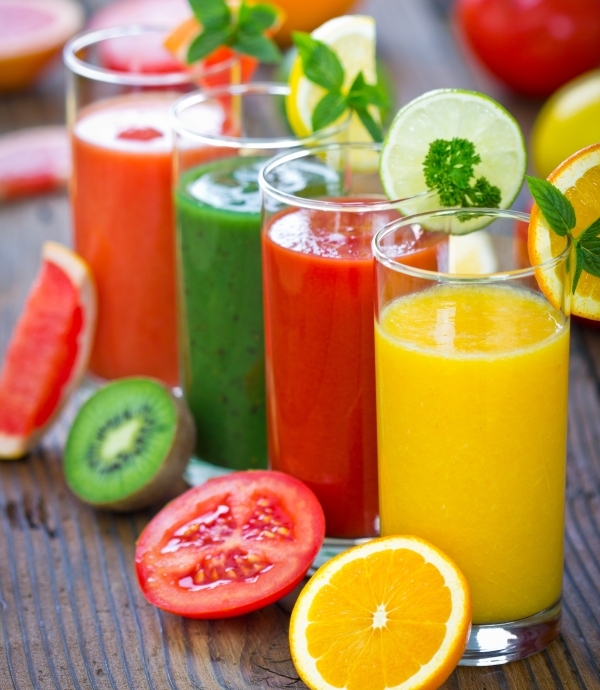 To make a smoothie, pick a combo of ingredients that work with the container amounts that you want to use. Mix and match and have fun! Most of these will work well with the small Nutribullet size. In a standard blender, just dump them all in and blend. For example, you could use 2 purple containers and one red to make a strawberry banana smoothie with vanilla protein powder or Greek yogurt. I tend to prefer milk or soy milk over water for my liquid, and these count as yellow. Usually adding that amount to the Nutribullet fill line will count as one yellow container. Toss in 6 almonds for half of a blue container if you want an extra boost to help fill you up. You can also add chia or flax which falls under the orange container. Here are 10 modified recipes with links to them on the site. I have modified the ingredients to fit the plan better and included the container amounts listed here. The recipes themselves explain their particular nutritional benefits but are often formulated for a larger cup size, so they differ slightly on their individual pages than from what I list here. Don’t want to use a yellow container? Leave out the milk or milk substitute and replace it with water. Flax, which is in many of my recipes, could also be omitted to save on using your orange container. Banana Berryicilous: 1/2 banana, 1/2 c blueberries, ground flax seed, almond milk = 1 purple, 1 yellow, 1/2 orange. Peachy Keen: 1 medium peach, ground flax seed, 6 unsalted almonds, 1/2 cup vanilla Greek yogurt, milk or almond milk = 1 purple, 1/2 blue, 1/2 orange, 1 red, 1 yellow. High Protein Berry Blend: 1/2 cup fresh or frozen blueberries, 1/2 cup fresh or frozen blackberries, 1 kiwi, ground flax seed, 3/4 cup plain Greek yogurt, 8oz Coconut Milk = 1 1/2 purple, 1/2 orange, 1 red, 1 yellow. Sunshine Smoothie: 5 baby carrots, 1 medium orange, juice of one lemon, 6 oz unsweetened coconut milk = 1/2 green, 1 purple, 1/2 yellow. Cucumber Cooler: 1 medium cucumber, juice of one lemon, 1 pear, 3/4 c plain Greek yogurt, water to the fill line=1 green, 1 purple, 1 red. Bloody Mary Smoothie (sans alcohol): 1/2 cup low sodium tomato juice, 1 small tomato, 1/2 cup cucumber, juice of one lemon, dash Sriracha sauce, 1tsp. Worcestershire sauce, 5 ice cubes = 2 green (I’m counting the sriracha and Worcestershire as freebies and the tomato juice as a veggie). Ginger Apple Carrot Smoothie: 1 T grated ginger, 5 baby carrots, 1 apple, juice of one lemon, 1/2 tsp cinnamon, 1/4 tsp allspice, 1/4 tsp nutmeg, water to fill line = 1/2 green, 1 purple. 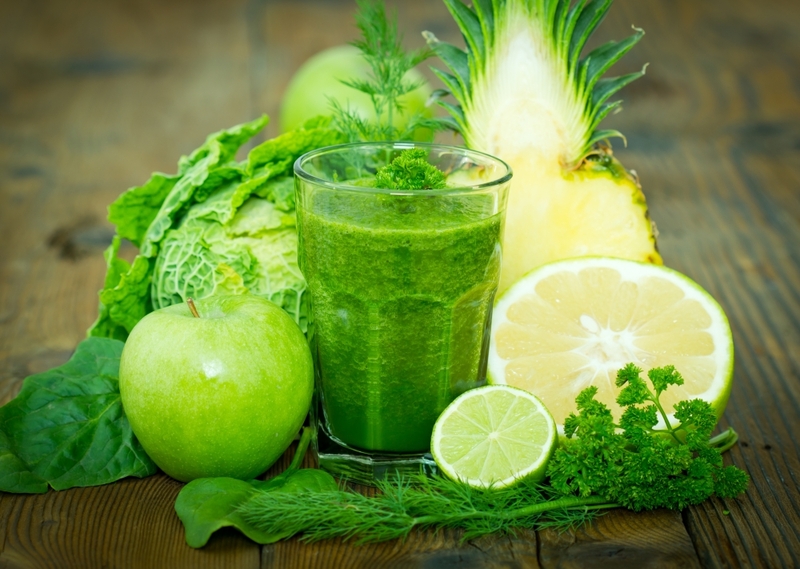 Green Tea Vegetable Smoothie (one of our most popular recipes): 3 Broccoli Florets, 2 Cauliflower Florets, 2 Pineapple Spears, Green tea to the fill line = 1 green and 1 purple. In most of the recipes on your website “21 Day Fix Modified Smoothie Recipes” you have mentioned 1 green, 1 purple, 1 red and one yellow. Do not quite get it what you mean by that. Will appreciate your response. The 21 day fix diet uses colored containers to measure portion size and then tells people how many of those they can have each day. So I gave the number of each container that the recipe would use for those who are following that diet plan. You can learn more about the 21 Day Fix diet here. Hi! A lot of individual recipes on this site are based on the large cup size for the standard Nutribullet and the 900 (not the colossal cup on the RX, which is huge). But when I listed ingredient suggestions in this post, most of those would fit in the small cup size. When in doubt, use the bigger cup for mixing though. Things mix fine with the cup not being full, but overfilling the cup usually leads to problems. where do we get the coloured containers from ? or if we know the measurments of the cups can we just use any cup. assuming by the colours do they refer to vegetables, fruits and dairy products ? You can google and find the measurements of the cups and just do that. Otherwise, Beachbody sells the cups. 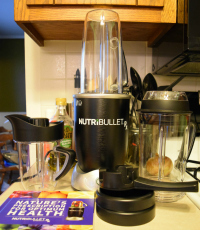 I just received a NutriBulliet for a Mother’s day gift. I am looking up recipes for it and found your site. What is a 21 Day Fix? My father is very thin, 91 years, do you have any recipes to help him put on some weight? I have been ill and gained weight, any recipes to loose weight in a healthy way? It is the amount of ice that fits in a one cup measuring cup. That usually is around 5-6 larger size ice cubes. You could also just put a big handful of ice in. The measurements on smoothies do not need to be exact, especially when it comes to adding ice. For example, don’t let the amount of ice take you over the fill line. Put less in if it does that. Thanks so much for this cheat sheet! I am doing the 21 day fix and this is so helpful! Can I share this link with my coach? Yes, of course you can share the link. Thanks! Just want to thank you for taking the time to share all this information. I love the cheat sheet! You have just made my life a lot easier. I’m currently doing the 21 day fix with great results so far. Thanks so much again.